Ethylene-dependent gravitropism-deficient and yellow-green 1 (EGY1) protein is required for chloroplast development and photosynthesis conduction. The egy1 deletion mutants have a yellow-green phenotype and reduced granal thylakoids. Furthermore, the yellow-green phenotype of egy1 mutants is more obvious than that of wild-type (WT) plants with increasing leaf age, suggesting an early senescence in the egy1 mutants. However, the relationship between EGY1 functions and leaf senescence still remains poorly understood. We observed that egy1 mutant leaves were more yellow than those of WT (the same age) in Arabidopsis thaliana. In accompany with this phenotype, leaf survival, chlorophyll content, Fv/Fm and soluble protein content decreased, and ion leakage increased significantly in egy1 mutants compared to WT plants. At molecular level, the expressions of senescence-associated genes increased, and photosynthesis genes decreased significantly in the mutants compared to those in WT plants. Furthermore, after darkness treatment, the yellow-green phenotype of egy1 mutants was more obvious than that of WT. These results indicate that the loss-of-function of egy1 gene induces leaf senescence in A. thaliana. In addition, our results showed that the yellow-green phenotype, chlorophyll content and ion leakage of egy1 mutants was partially restored after exogenously applied glucose for 5 weeks. At the same time, the expression of hexokinase 1 (HXK1) and/or senescence-associated gene 12 (SAG12) in egy1 mutants growing on 2 % glucose was lower than that in egy1 mutants without glucose. EGY1-defection induced leaf senescence and this senescence was partially restored by glucose in A. thaliana. The leaf is a specialized photosynthetic organ of plants, serving as the major site of producing energy and nutrients. Its development stages include initiation, growth, differentiation, maturation and senescence. Leaf senescence, the last stage of leaf development, plays a key role in plant survival and/or death. During leaf senescence, plant cells undergo orderly changes in structure, metabolism and gene expression (Buchanan-Wollaston et al. 2003; Guiboileau et al. 2010). Among these, the degradation processes of chlorophyll, proteins and lipids have been largely investigated (Hortensteiner and Feller 2002; Wiedemuth et al. 2005). Chlorophyll degradation typically starts at the leaf margins and progresses to the interior of the leaf blade (Kakani et al. 2004). Protein degradation is the most significant breakdown process that takes place during senescence (Buchanan-Wollaston et al. 2003). Other organelles, such as the liposome, also undergo biochemical changes as senescence proceeds (Hung and Kao 1998). Leaf senescence is usually triggered by internal age-dependent factors, which include the expression changes of senescence-associated genes (SAGs), and the mutants of leaf death inducing genes, jasmonic acid-associated genes and other key genes (Castillo and Leon 2008; Guo et al. 2004). However, some external factors such as the alterations of nutrient, light and other environmental factors also initiate leaf senescence (Guiboileau et al. 2010; Ono et al. 2001). Of course, the defect of a gene associated with producing a nutrient (such as sugar) has the same effects as the external factors mentioned above (Loreti et al. 2008). Sugar signaling pathways are important regulation mechanisms for leaf senescence in plants (van Doorn 2008), which consists of glucose, sucrose, trehalose and other hexokinase-independent sugar signaling pathways (Smeekens et al. 2009; Xiao et al. 2000). Among these, the glucose signaling pathway is considered as one of the most important mechanism responsible for senescence and has been extensively studied (Balasubramanian et al. 2008). And hexokinase 1 (HXK1) acts as the direct glucose sensor mediating multiple functions in the glucose repression and glucose promotion of transcription and growth (Cho et al. 2006). Nuclear mutations that cause albino or pale green phenotypes because of reduced levels of chlorophyll in the chloroplasts have been found frequently in higher plants (Bellaoui and Gruissem 2004; Vinti et al. 2005). These mutants usually have normal leaf anatomies, but typically show defects in chloroplast ultrastructure and composition (Aluru et al. 2007). The mutants of egy1 (which coding for a protein named ethylene-dependent gravitropism-deficient and yellow-green 1, EGY1) are such plants of Arabidopsis thaliana because EGY1 protein is required for chloroplast development and photosynthesis conduction (Chen et al. 2005; Guo et al. 2008), and the yellow-green phenotype of egy1 mutants is more obvious than that of wild-type (WT) plants with increasing leaf age. Although the photosynthesis characteristics of egy1 mutants have been studied extensively, the relation between egy1 mutation and leaf senescence is completely unknown. Since there was little attention given to color mutants and leaf senescence (Yoshida et al. 2002), we aim to explore the effects of EGY1-defection on leaf senescence and to further elaborate its potential mechanism in this paper. The T-DNA insertion line SALK-134931 was obtained from the Arabidopsis Biological Resource Center (ABRC, Ohio State University), and plants homozygous for the egy1 mutation (also known as egy1-2 in Chen et al. 2005) were used for further analysis. Wild-type and the mutant plants were grown under 10-h-light/14-h-dark cycle with a photon flux density of 120 μmol m−2 s−1 at 22 °C. To ensure synchronized germination, the seeds were sown and then maintained in darkness for 48 h at 4 °C. For dark treatment, 3-week-old seedlings of WT and egy1 mutant plants were placed in complete darkness for 3 days at 22 °C. For complementation of the egy1 mutants, cDNA containing the EGY1 coding region was amplified by PCR with the sense primer 5′-GGATCCAATGGGGACTCTCAC-CAG-3′ and antisense primer 5′-CGAGCTCTCACTAGTGTACATACATGGC-3′. The PCR product was cleaved with BamHI and SacI and cloned into the plant expression vector pSN1301 under the control of the cauliflower mosaic virus 35S promoter. The construct was transformed into Agrobacterium tumefaciens strain C58 and introduced into egy1 plants by the floral dip method (Clough and Bent 1998). Transformed plants were selected on MS medium (Murashige and Skoog basal liquid medium; Sigma-Aldrich) containing 50 mg mL−1 hygromycin. The success of the complementation procedure was confirmed by PCR analysis and chlorophyll contents detection on the resulting plants. All these parameters were measured with the fifth rosette leaves, which were harvested at specified days counted from the day of leaf emergence. Leaf survival was determined by the mortality curves, which was the percentage of leaves that didn’t show full yellow (full yellow leaf was considered as dead) versus all leaves. Chlorophyll contents were quantified as described by Sims and Gamon (2002). The photochemical efficiency of PSII was deduced from chlorophyll fluorescence parameters measured using a portable plant efficiency analyzer (Hansatech Instruments, Morfolk, England). The ratio of maximum variable fluorescence to maximum yield of fluorescence (Fv/Fm) was used as a measure of the photochemical efficiency of PSII. Protein was extracted in 10 mM Hepes–KOH (pH 8.0), 10 mM MgCl2, 330 mM sorbitol, 2 mM PMSF and concentration was determined with a protein assay kit (Bio-Rad, CA, USA) using bovine serum albumin as a standard. Membrane ion leakage was determined by measuring electrolytes leaked using a digital conductivity. Total RNA was extracted from 100 mg of fresh tissues using TRIzol reagent (Invitrogen). For the determination of the gene’s expression, RT-PCR was performed using the following primers: sense (5′-TCGCTTTTGCCGCTGCCGTTAACATTAG-3′) and antisense (5′-AAAGCTAACACGAGCACCACCGCGAGG-3′). To ensure equal amount of RNA in each sample, RT-PCR analysis of actin cDNA was performed using the following primers: sense (5′-AACTGGGATGATATGGAGAA-3′) and antisense (5′-CCTCCAATCCAGACACTGTA-3′). Northern blot analyses were performed essentially as described previously (Sambrook and Russell 2001). The fifth leaves were harvested from WT and egy1 plants at 26, 33 and 40 days after germination, and RNAs were separated on a 1.0 % agarose/formaldehyde gel, then transferred onto Nylon membranes (Amersham Pharmacia Biotech). The membranes were probed with 32P-labelled cDNA probes specific for senescence-associated gene 12 (SAG12), SAG24, endo-xyloglucan transferase/xyloglucan endo-1,4-beta-d-glucanase (SEN4), chlorophyll a/b-binding protein (CAB), and the rubisco small subunit gene (RBCS). Ethidium bromide staining was used as a loading control. Following high-stringency hybridization and washing, all the blots were exposed to X-ray film. 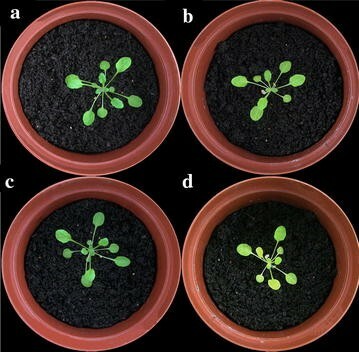 Arabidopsis thaliana seeds were sown on half-strength MS plates containing various concentrations of glucose, and plates were placed at 4 °C for 2 days for vernalization. They were germinated and maintained at 22 °C in darkness for 6 days and illuminated at 22 °C for 12 h. The hypocotyl lengths of seedlings were measured. At the same time, WT and egy1 plants were grown on 2 % glucose + MS medium in a 500 cubic cm glass jar for 5 weeks, and then the phenotype were observed, the chlorophyll contents, ion leakage were determined, and the expressions of hexokinase 1 (HXK1) and senescence-associated gene 12 (SAG12) were quantified. Primer pairs for the quantitative PCR were: 5′-GCAGACTTCTCTGTCCTCTGG-TAG-3′ (forward) and 5′-TCCAACAACATCTTGTCCAACTGC-3′ (reverse) for HXK1; 5′-AAGGAGGAAAACAATCGCTAC-3′ (forward) and 5′-GCAAACTGA-TTTACCGCAAG-3′ (reverse) for SAG12; 5′-CGTACAACCGGTATTGTGCT-GG-3′ (forward) and 5′-CTCTCTCTGTAAGGATCTTCATG-3′ (reverse) for actin. The quantitative PCR was performed with a Mx3000P Real-Time PCR System (Stratagene, Agilent, USA) using SYBR Green SuperMix (Takara) with the following conditions: 30 s at 95 °C; 40 cycles of 10 s at 95 °C, 10 s at 55 °C and 12 s at 72 °C, with final melting for 15 s at 65 °C. Melting curve analysis was performed to confirm the specificity of the amplification and to identify putative unspecific products. Actin mRNA, set to 100 %, was used as an internal standard in all experiments. The quantitative PCR experiments were repeated at least three times for a cDNA prepared from three batches of plants. The T-DNA insertion line (SALK-134931, Fig. 1a) (Columbia background) was obtained from the Arabidopsis Biological Resource Center (ABRC) at Ohio State University. The homozygosity of plants was confirmed by PCR amplifying and sequencing. To study the effect of the T-DNA insertion on At5g35220 expression, we analyzed the results of RT-PCR, which showed that this gene was undetectable in the mutant, while it was normal expressed in WT plants (Fig. 1b). The oldest egy1 mutant leaves had the most intense yellow-green phenotype (Fig. 1c). Complementation of egy1 mutants was performed to ensure the function of EGY1 (Fig. 1c). The fifth rosette leaves emerged on the same day both in the egy1 mutants and WT plants. The yellow-green of young leaves and albino of old leaves in egy1 mutant (Fig. 2a) was not due to difference in the number of leaves. Yellowing of the egy1 leaves happened first at the tip of the leaf blades, later spread to the end of leaf blades. The leaves sometimes developed chlorosis along the midrib (Fig. 2b–f). In order to examine the physiological state of the egy1 mutants, the survival, chlorophyll content, Fv/Fm, soluble protein content and ion leakage of the fifth leaves were measured in this study. We first examined the effect of visual leaf longevity (representing the leaf survival) in the egy1 mutation (Fig. 3a). We observed that the leaf longevity of egy1 was shortened by 40.1 %. The time it took 50 % of leaf population to survive was 22 days after leaf emergence in the mutants, while it was longer, 37 days, in the WT plants (Fig. 3a). The chlorophyll content of egy1 mutants at 10 days of leaf emergence was <50 % of that in the WT plants (Fig. 3b). Chlorophyll content decreased in egy1 mutants after 20 days, while it was stable until 30 days of leaf emergence in WT leaves (Fig. 3b). The Fv/Fm ratio, which reflects the photochemical quantum efficiency of PSII, was similar in egy1 mutants and WT plants at 15 days of leaf emergence. But after 20 days, the Fv/Fm ratio began to decrease in egy1 leaves, whereas it did not decline until 25 days in WT leaves (Fig. 3c). At 10 days after leaf emergence, soluble protein contents were measured in egy1 mutants and WT plants. Soluble protein began to decrease on the 15 days of leaf emergence in egy1 mutant, while it increased until 20 days in WT leaves. Protein contents decreased below 60 % of the initial level at 25 days of leaf emergence in egy1 mutants and after 35 days in WT (Fig. 3d). Ion leakage, an indicator for the intactness of the plasma membrane, began to increase 15 days after leaf emergence in egy1 leaves, and its ratio continued increasing significantly throughout the growth period. However, ion leakage in WT leaves began to increase until 30 days. Moreover, there was no increase in the ratio throughout the growth period in WT plants, unlike egy1 mutants (Fig. 3e). To evaluate leaf senescence in the egy1 mutants at molecular level, the transcription levels of SAG12, SAG24, SEN4, CAB and RBCS were examined by RNA gel-blot analysis. The transcripts of SAG12 in egy1 plants accumulated ca. 207 % at 33 days and ca. 400 % at 40 days compared with that of 26 days after germination, which was more than those in WT plants (Fig. 4). The transcripts of SAG24 and SEN4 were also increased in egy1 mutants. Similarly, the transcript levels of CAB and RBCS decreased more obviously in egy1 plants than those in WT plants with increasing leaf age (Fig. 4). 27-Day-old WT and egy1 plants (Fig. 5a, b) were placed in a dark chamber in order to observe phenotypic changes due to darkness. After 3 days, the yellow-green phenotype was more obvious in egy1 mutants (Fig. 5d) than that in WT plants (Fig. 5c). Cotyledon greening in WT was almost the same as in egy1 mutants regardless of treatment with or without 1 % (56 mM) and 2 % (111 mM) glucose (Fig. 6a). However, cotyledons greening was inhibited in egy1 plants treated with 4 % (222 mM) and 6 % (333 mM) glucose, and in WT plants with 6 % glucose (Fig. 6a). Moreover, hypocotyl elongation was increased from 0 to 2 % glucose both in WT and egy1 seedlings (Fig. 6b), while it was inhibited under 4 % and 6 % glucose both in egy1 and WT seedlings (Fig. 6b). Next we planted WT and egy1 mutants on 2 % glucose for 5 weeks. The results showed that yellow-green phenotype of egy1 mutants was partially restored by glucose treatment (Fig. 7a). Chlorophyll contents were increased and ion leakage was decreased in egy1 mutants applied with 2 % glucose compared to those without glucose treatment (Fig. 7b, c). The results from quantitative PCR analysis indicated that the high expressions of HXK1 and SAG12 in egy1 mutants were impaired by 2 % glucose treatment for 5 weeks (Fig. 8). In general, leaf senescence is dependent on age and developmental stage under normal conditions and in the absence of external stress, and the leaf yellowing during senescence is usually observed in old leaves. In this study, the leaf yellowing phenotype of egy1 mutant and WT plants is also related to the increasing leaf age and leaf normal development. However, egy1 mutant leaves are more yellow than those of WT plants at the same age and development stage (Figs. 1, 2), suggesting that egy1 mutants have an early-senescence phenotype. To further confirm the early-senescence phenotype, we measured the physiological characteristics associated with senescence in egy1 mutants. The leaf longevity was lower in egy1 mutants than that of WT plants (Fig. 3). Similar results were detected in apg7-1 mutants of Arabidopsis which showed an early-senescence phenotype (Doelling et al. 2002). Chlorophyll can provide basic information of photosynthesis and photosynthesis defects is an important feature of senescence. Our results showed that chlorophyll contents were also reduced in egy1 mutants (Fig. 3), which was similar to the reported data by Frick et al. (2003) in porB-1porC-1 double mutant of older seedlings and by Stettler et al. (2009) in mex1 leaves. Proteins are fundamental components of all living cells and are necessary for the proper functioning of an organism, and could be decreased during leaf senescence. We found that egy1 mutation had decreased soluble protein contents (Fig. 3), similar tendency was also detected in hys1 and apg7-1 early-senescence mutants (Doelling et al. 2002; Yoshida et al. 2002). Ion leakage is an indicator of membrane integrity. When leaf senescence, membrane became fragile and leak. In egy1 mutants, ion leakage was increased (Fig. 3). Taken together, these results suggested that the egy1 mutants had early-senescence traits. Leaf senescence is accompanied by increased expression of senescence-associated genes (SAGs) and decreased expression of genes related to photosynthesis (Lim et al. 2003; Zentgraf et al. 2004). The transcript levels of SAG12, SAG24 and SEN4 genes were increased in senescent leaves (Wu et al. 2008; Yoshida et al. 2001), while CAB and RBCS genes were down-regulated during leaf senescence (Woo et al. 2001). Similar results were found both in egy1 mutants and in WT plants with increasing leaf age. It is notable that, SAG12, SAG24, SEN4 increased and CAB and RBCS decreased more obviously in egy1 mutants compared to WT plants (Fig. 4). These results indicated that leaf senescence occurred indeed in transcript level in egy1 plants. Leaf senescence could be induced by external stresses, such as darkness. Darkness treatment induced uniform and rapid senescence (Chrost et al. 2004; del Rio et al. 2003; Mishev et al. 2009). After 3 days of dark treatment, egy1 mutant leaves were more yellow while the phenotype of WT plants had no obvious changes (Fig. 5), suggesting that egy1 mutants had an early-senescence phenotype under normal conditions and in darkness treatment. So EGY1 should have an important role in leaf normal development in A. thaliana. As the egy1 mutants have a wide variety of senescence symptoms, the egy1 gene most likely functions as a regulatory component controlling functional leaf senescence rather than as a protein directly executing the senescence process (Kim et al. 2009; Lim et al. 2010). The chloroplasts in egy1 mutants had reduced granal thylakoids, poorly developed lamellae networks and decreased photosynthetic proteins (Chen et al. 2005). The loss in photosynthesis caused cellular sugar starvation, and lack of energy (Patro et al. 2014). Sugar starvation is known to affect leaf senescence, repress hypocotyl elongation, cotyledon greening and shoot development (Arru et al. 2008; Gazzarrini and McCourt 2001). In tobacco plants, sugar starvation accelerated leaf senescence, suggesting that sugar signaling could directly or indirectly promote leaf senescence (Wingler and Roitsch 2008). This starvation could be restored after exogenously applied sugars through sugar metabolism with complex sugar signaling network. Yoshida et al. (2002) found that hys1 seedlings with exogenously applied sugars were hyper-responsive to glucose, implying that sugar may play a role in the early induction of senescence. In our study, hypocotyl elongation was increased in egy1 seedlings growing on 2 % glucose. Furthermore, the yellow-green phenotype of egy1 mutants was partially restored by 2 % glucose (Fig. 7), suggesting that the symptom of early senescence was relieved after glucose supplementation. Meanwhile, the expressions of HXK1 and SAG12 (which are usually at a high level in senescence leaves) were obviously decreased in egy1 mutants by 2 % glucose (Fig. 8), implying that the early senescence of egy1 mutants may be due to sugar starvation. It therefore could be restored by exogenous glucose treatment. With regard to the inhibition of cotyledons greening or hypocotyl elongation by 4% or 6 % glucose, it is a result from the effects of high concentrations of glucose in the medium and has been reported in the previous study (Jang et al. 1997). In conclusion, our results suggest that leaf senescence induced by EGY1-defection may be due to sugar starvation and can be partially restored by glucose in A. thaliana. EGY1 regulated leaf senescence provides key information to understand the molecular mechanism of leave senescence in plants. CYC conceived and designed the experiments. CYC XZ performed the experiments. JW analyzed the data. CYC wrote the paper. All authors read and approved the final manuscript. This research was supported by National Natural Science Foundation of China (31300226), the National Basic Research Program of China (2013CB429904) and the Natural Science Foundation of Gansu Province (1308RJYA094).